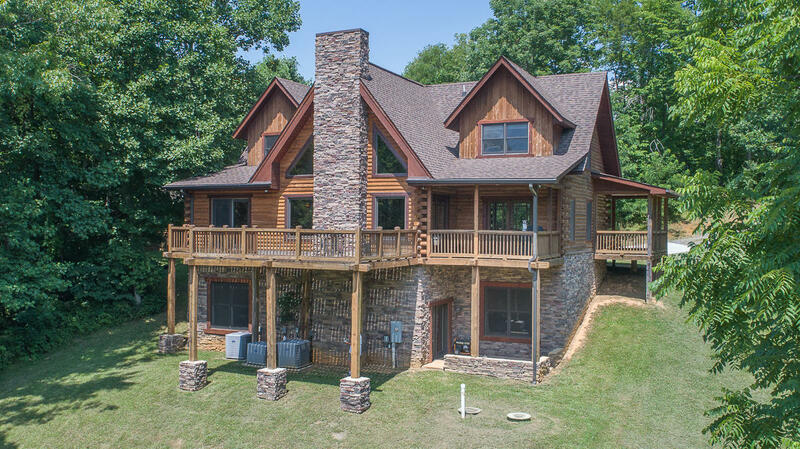 Beautiful log home w/wrap-around front porch, privately set on 8.4 acres, located just minutes from Roanoke & Daleville. Timber Frame deck & entry level Master BR w/balcony overlooking pond & pasture. Custom details throughout; Black Walnut trim and cabinetry, Hickory & Mahogany vanities, Brazilian Cherry wood & slate floors, dry-stack stone fireplace & exterior accents. Huge laundry/mudroom & walk-in Pantry off kitchen. Basement has 12''x 12' poured concrete walls & offers impressive Rec Rm, Office, Storage & Mechanical Rms; 26'x 30' Log Garage w/carport, concrete circular driveway, chicken coop, treehouse, generator hookup & more! More land, 9.8 acres is available, mostly wooded w/trails! See listing #839571 View the virtual tour!